The all-white kitchen was among the most sought-after models in 2018 thanks to its clean, light and bright appearance. 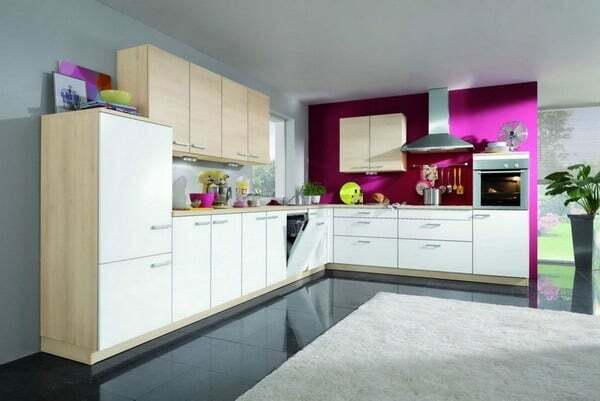 There are, however, many trendy options regarding the contemporary kitchen color and the right combination of shades adding a pinch of personality and a lot of freshness to your purist interior. 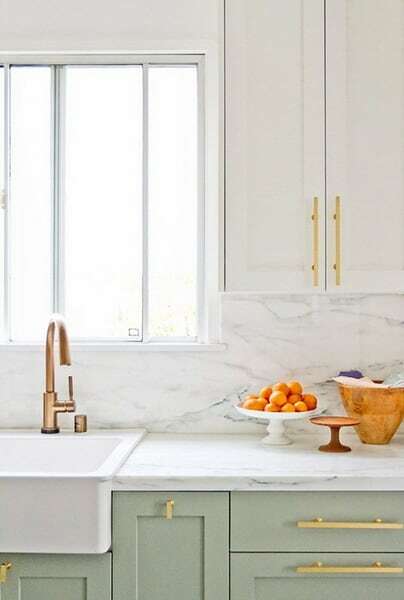 Take advantage of the 20 artistic ideas below illustrating the right color of kitchen 2019 to marry pure white! 12 Namely leather = luxury! The monochromatic field was very fashionable in 2018 and it seems that this trend will continue in full force and effect in 2019. 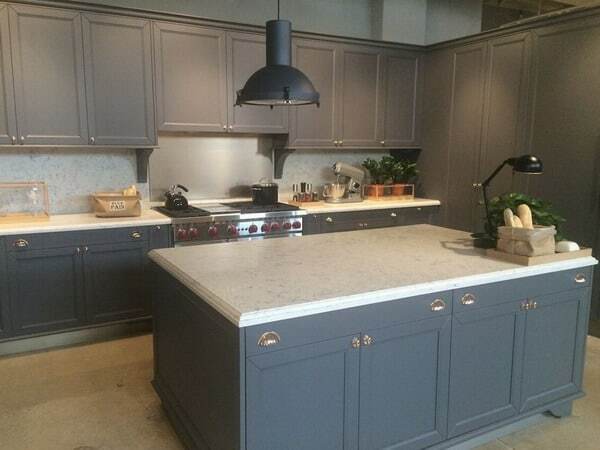 The taupe kitchen color, pearl gray and anthracite are just 3 of the many trendy possibilities in this sober spectrum. Opt for textural bursts of flooring, worktops, credence, or even light fixtures to create a visually appealing effect at great depth. 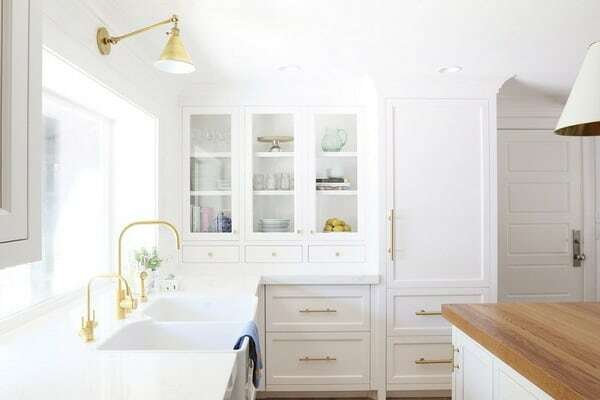 Of course, if you like the look of a white kitchen, but you want to get away from a sterile decor, there are subtle ways to do it successfully. 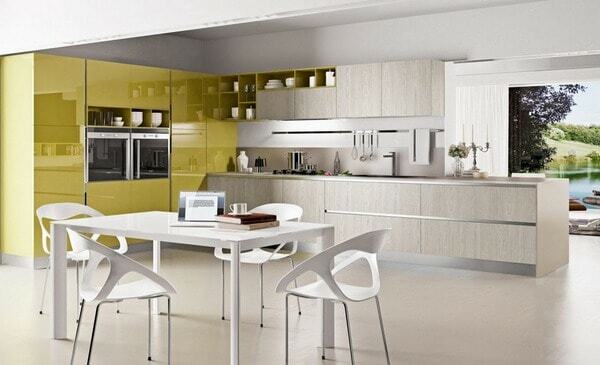 Choose metal cabinet handles, lights, fixtures and fittings, but in the warm spectrum. Please choose the finish gold, brass, bronze, copper etc. 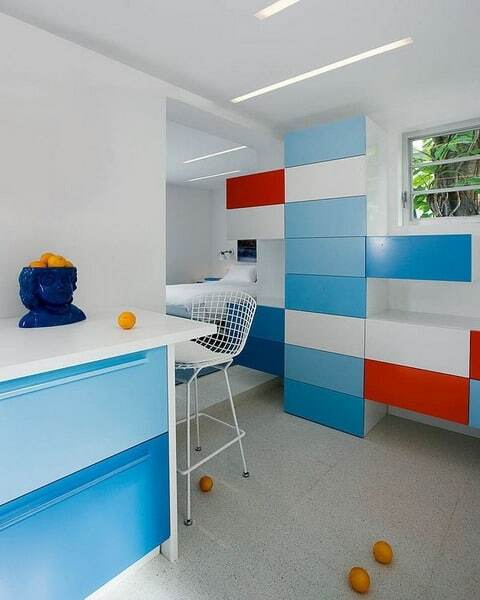 This is a striking combination of classic colors, seen through the prism of modern design. Red is replaced by orange poppy, while anthracite gray takes the place of black. The high gloss of the cabinet doors contrasts with the matte finish of the gray surfaces and further modernizes the space. 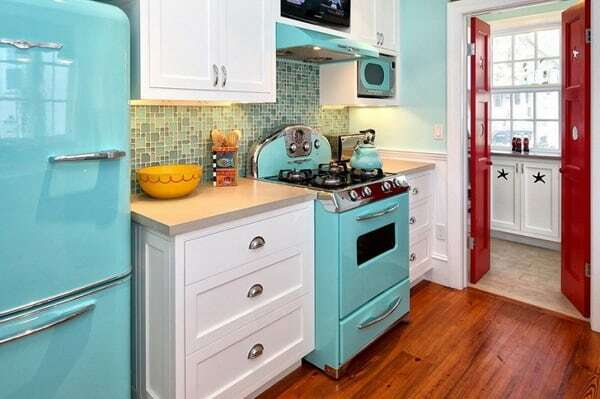 Frankly, the combination of aqua and red is not something that many people associate with modern kitchens . It’s actually an allusion to the ’70s, but since everything vintage is back, this surprising wedding can not miss our collection. The effect is super energetic, fun and welcoming at the same time. 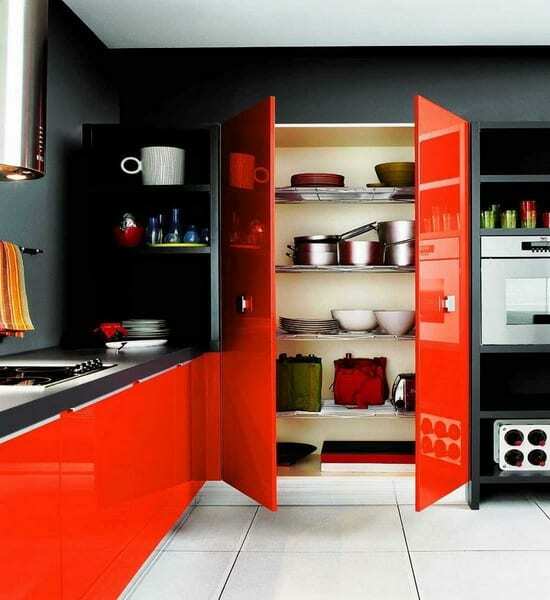 A bold kitchen color such as red, yellow or orange is not made for any contemporary homeowner. 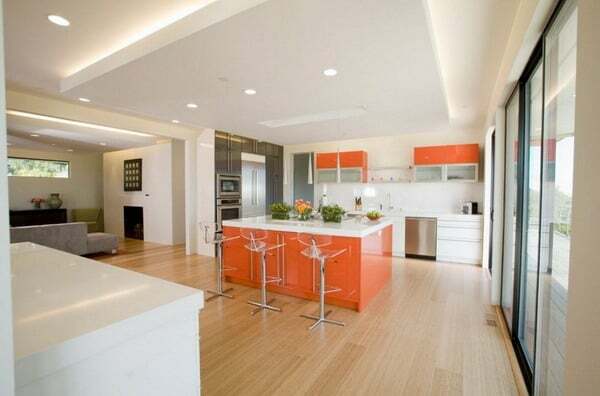 However, we can add touches of these tones, especially if it is a kitchen open to the dining room. 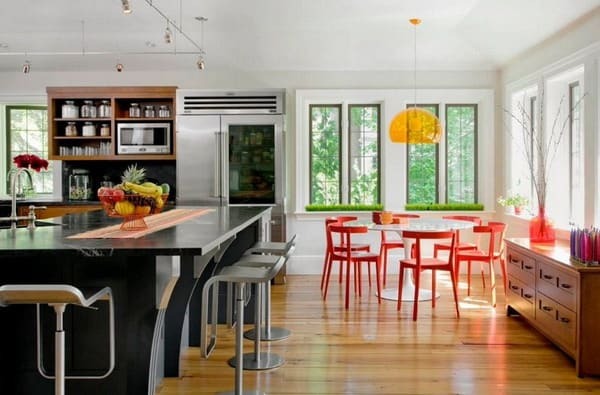 The orange-yellow transparent acrylic pendant and the modern red chairs around the white tulip table are the highlight in this otherwise neutral and organic kitchen, created by LDA Architects (link at the bottom of the page). 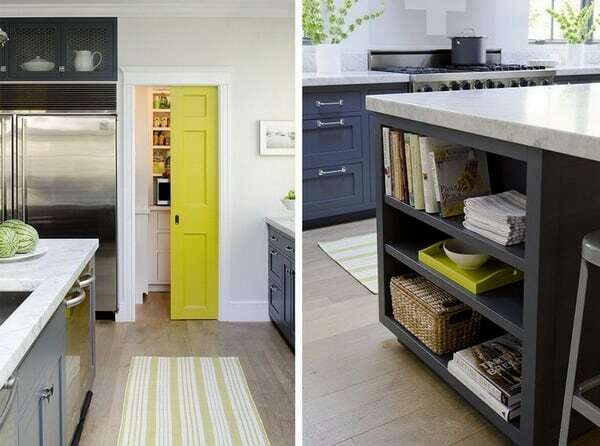 Whether it’s chartreuse green, pistachio or goose-poaching, this yellow-green color of the spectrum energizes the decor and is an excellent choice as a kitchen color to marry to white! 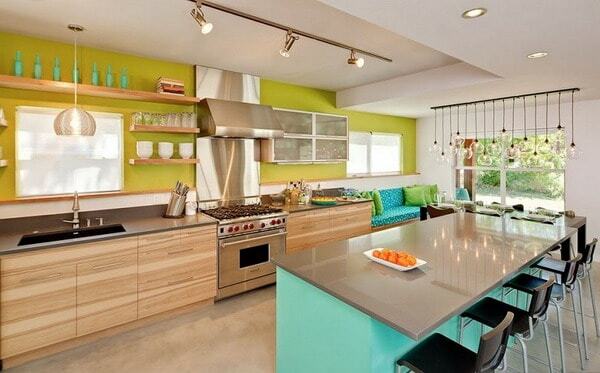 Add some light turquoise or aqua accents and you have an eye-catching interior that’s unmatched! Yes, you are right, “wood” is not a color, but a material. In any case, it is no longer a purely traditional material, as it is more and more often found in the modern design kitchen. Teal, petrol blue and turquoise, among them, are among the most favorite colors in 2018 that will also continue in 2019. 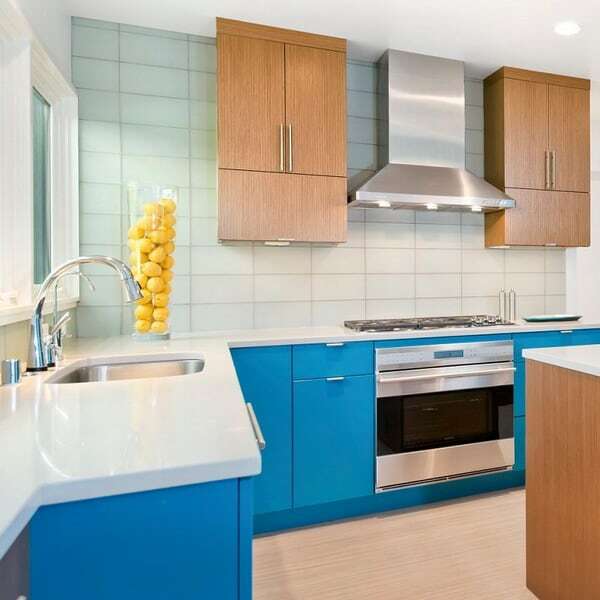 In this kitchen design by Alter Studio (link at the bottom of the page), we successfully married white to petrol blue, stainless steel surfaces with wooden finishes to obtain a bouquet of mismatched textures and fabulous colors. 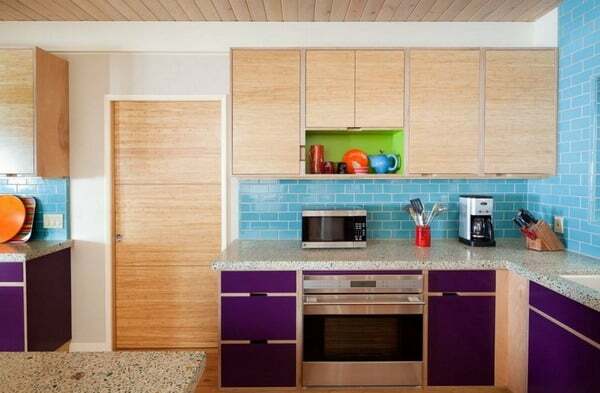 Adding a vibrant color to strategic locations can completely change the look of your kitchen without giving it a complete makeover. 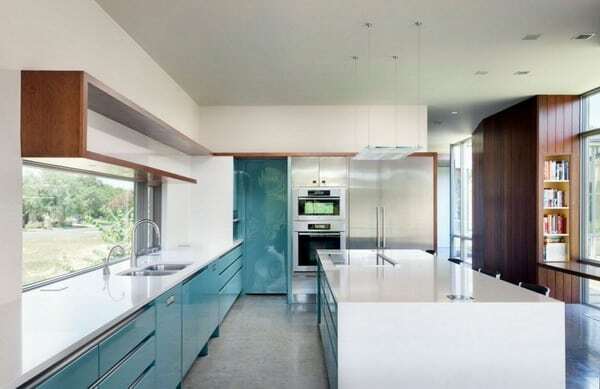 In this space, designed by Design Group Three, we see a vibrant and strong kitchen color, combined with several soft and pale shades – a good solution to balance the integral design. 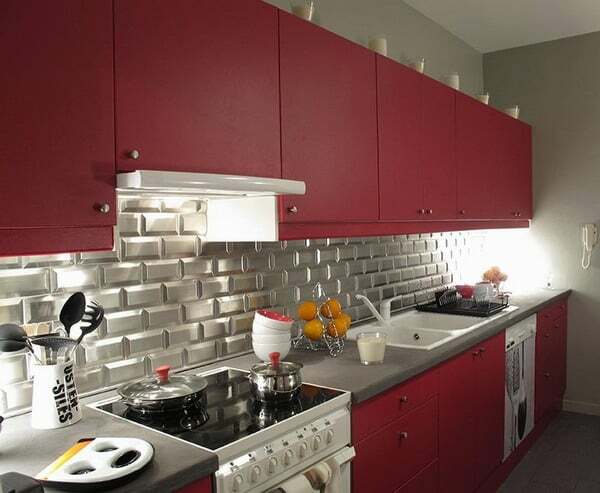 Combine the trendy white subway tile with the burgundy cabinet doors to create an aesthetic contrast. Alternate matte and shiny textures to energize and modernize the decor. 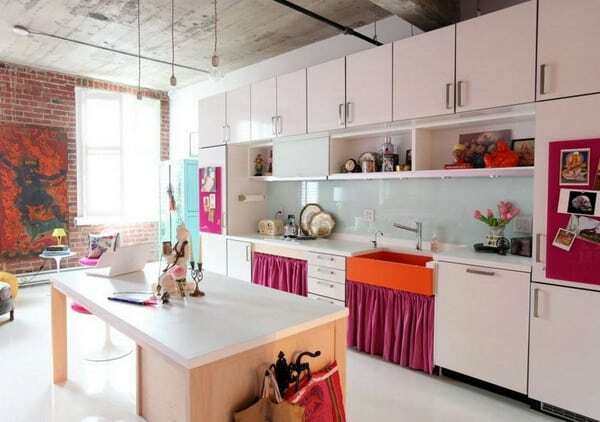 An alternative approach is to warm the white kitchen using another warm material such as leather. 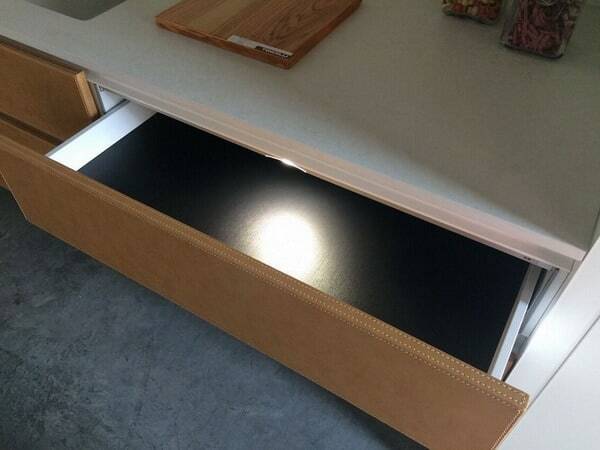 It can be used as a cover for the fridge, you can line the bar stools or cover a part of the front of the kitchen. 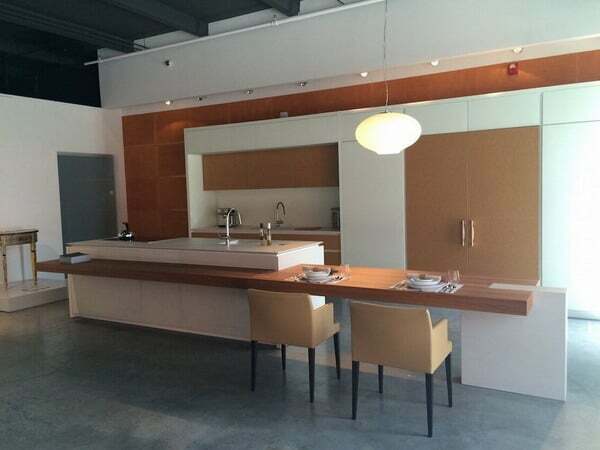 In addition, cognac or chocolate leather blends with wood in matching shades. Namely leather = luxury! 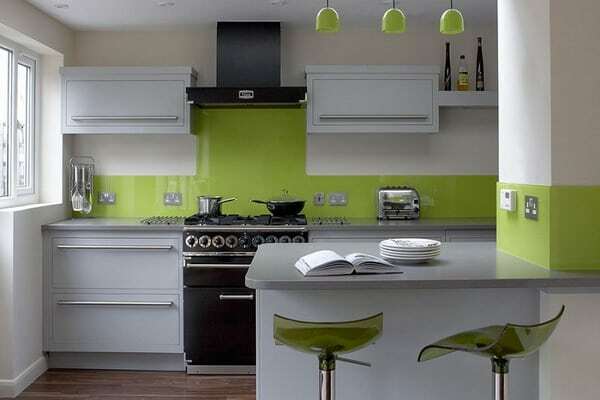 The chartreuse color, which has already been mentioned, is one of those retro-modern colors that is a true chameleon-it goes well with classic kitchens, but harmonizes as well in modern spaces! This combination of rich and warm colors by Robert Kaner Interior Design (pictured above) gives a super modern and teasing look at a time.